The main window shows the menu bar at the top with the quick access button bar right below it. On the left the directory Tree and on the right the selected items (file names) list. The Preview pane is visible below the directory Tree and a Rename pane is visible below the Item list. Items (files and/or directories) that meet the selection criteria are displayed in the Item list. Multiple (Ctrl+MouseClick) or all (Ctrl+A) items can be selected from the Item list. 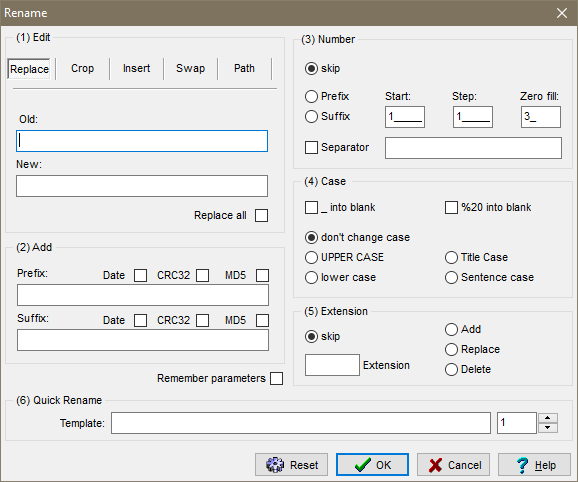 The Item list drop-down menu (or PopUp menu) can then be used to rename, copy, move, delete, view or open the selected item(s). The configuration window has multiple tab's to specify the default options for Selection, Scan functions, View parameters, Output formatting, Miscellaneous (confirmation, logging) options and Advanced (.ini file usage) settings. 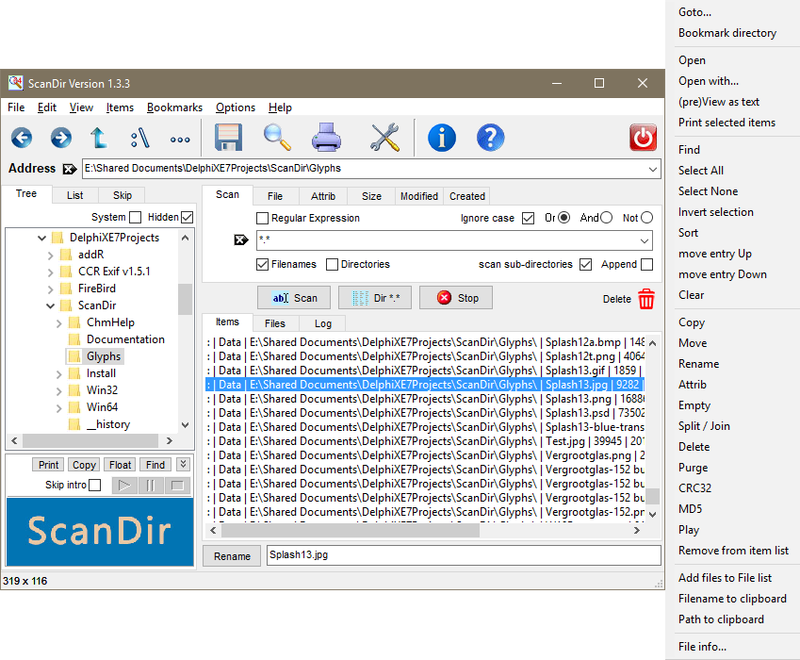 By default all selected files are copied / moved to the target directory, if [V] Copy full path is selected, the source directory structure is maintained. During copy / move files can be renamed and (re)numbered. 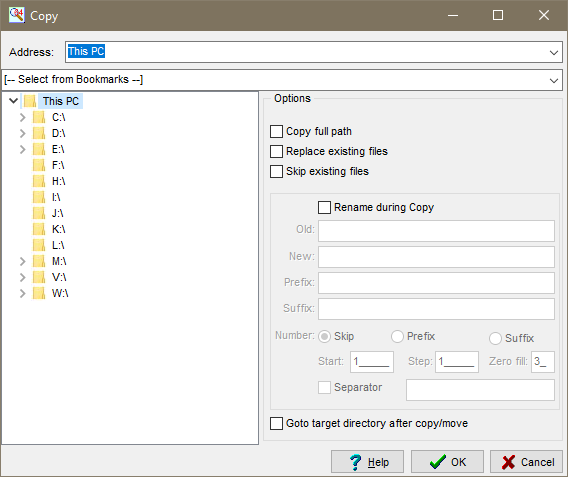 Check [V] Goto target directory after copy/move to switch to the target directory when all files are copied or moved. 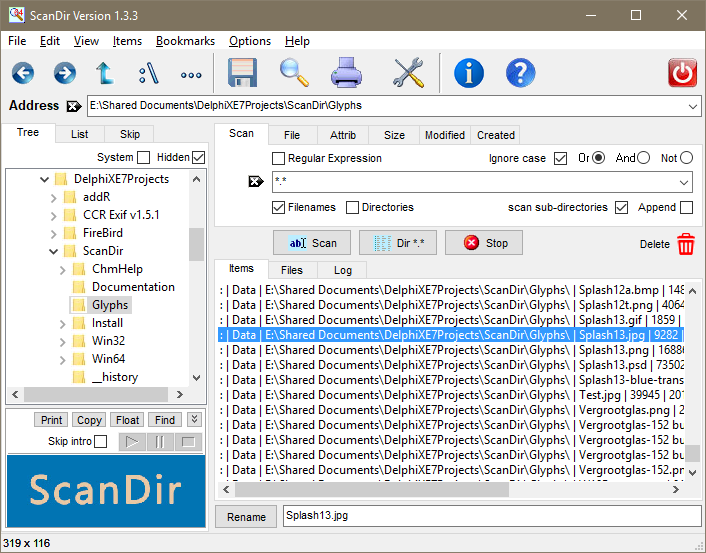 ScanDir has many options to rename multiple files. Chracter strings can be replaced, added or removed. Numbers, MD5 checksum, and the current date can be added. It is even possible to adde (parts of) the pathname to the file name. File extensions can be replaced, added or removed. 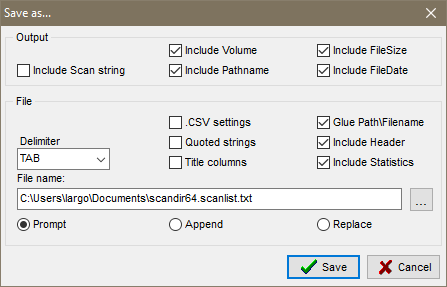 Before the file names in the item list are written to a text file, the user is prompted to specify how the item list should be formatted and which fields must be included. Check [V] .CSV settings to save as Comma Separated Values, a format that can be interpreted by many spreadsheet programs, such as MS Excel. Finally, the user can specify the action to be taken when the target file already exists.